consumers would have a hard time throwing the ad away. to the breathtakingly beautiful life-like chromolithographs printed using 12 or more colors of ink. considered “Business Cards,” or handbills if printed on thin paper and larger than a postcard. 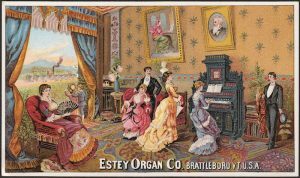 Additionally, Victorian novelty trade cards can be found in die-cut shapes, as well as in folding formats. Sometimes they are even composed of wood veneer, celluloid, aluminum, or some other novelty material. 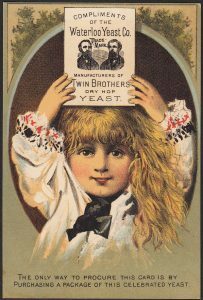 Currier & Ives dabbled in printing trade cards between 1877 and 1882. Their 12 or so series featured a range of subjects running from Sports Comics and City Views to Railroad Trains and Champion Race Horses. Most of the 200+ known C & I card designs are of average size and quality, printed in 3 to 5 colors and cut to about 5 inches in width, slightly smaller than a modern postcard. Experts and collectors hold various opinions about what should be considered the oldest trade cards. happening in the shoe trade or the saloon trade, or what the tradesmen were doing about the unions. offer a “trade” card to a potential client to help promote their business or services. 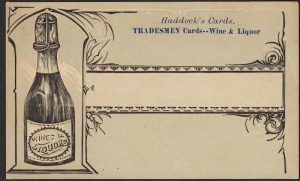 The Haddock card company of Philadelphia specialized in producing “stock” cards for all of the major trades. This example is labeled a “Tradesmen Card,” and was specifically targeting businesses in the “Wine & Liquor” trade. Bottlers, liquor stores, and even saloons could buy these cards in bulk, and then have their business name, address, and advertising imprinted into the blank slug areas. It could be argued that the earliest trade and tradesmen cards were printed in Europe in the 1600’s. Some of these cards included illustrations, but many did not. American Revolution, and many of his designs were actually beautifully artistic. from the earlier tradesmen cards and the blander “business” cards which lack illustrations. Very few cards actually say “Trade Card” in their text. 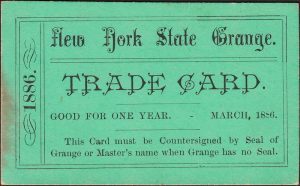 This green “Trade Card” from the New York State Grange, dated 1886, was used like a trade token. In the past, trade tokens (usually similar in size and composition to a coin) were often issued by specific stores, saloons, and transportation companies to encourage repeat business and loyalty to the one company over others. free exhibit souvenirs from vendors at the 1876 Centennial Exposition in Philadelphia. the benefits of their brands in the most spectacular and memorable ways possible. rainbows of colors and extravagances in chromolithographed images made Victorian trade cards an instant hit. and producing them in virtually every major city in America. considered respectable if it was not issuing cards worthy of a collector’s album. 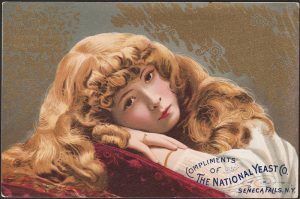 Exhibitors at major fairs and expositions often provided free souvenir cards for those who visited their booths. 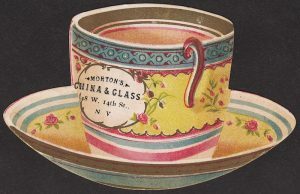 These cards typically featured proud and patriotic images, as well as depictions of fairground buildings linked to the marvels of the products being promoted. This 1893 Columbian Exposition card for Enterprise Meat Grinders is unusual in that it is an example of early off-set printing; most Victorian trade cards were printed as lithographs. of cards at at time. to the needs of even a handful of stores on Main Street. These go-getters would purchase an inexpensive box of assorted “stock cards” from the big cities. Stock cards arrived in bulk with blank areas for imprinting local business names and addresses. An even less expensive option was to apply a name and address by means of a rubber stamp. of white borders would be eliminated when a card was pasted into a scrapbook. Discussions were held on the merits of mounting cards with flour pastes rather than with leather glues. as well as how to select certain types of albums to reflect the highest possible level of sophistication. but parents got in on the fad as well. as much the mother’s project as anyone’s. sports cards, joke cards, and actress cards… with the interests of men in mind. They could even be found packaged as “prizes” inside coffee tins or boxed products. Examples from this “Card Fiends” series can be found with imprints from locations all over North America. 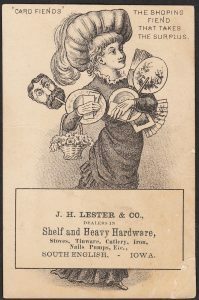 The female shopper in this example has filled her arms with Victorian trade cards, advertising card die-cuts, and card novelties from every store in town. Note the imprint for a hardware store in South English, Iowa… a town today with only a few over 200 souls. to purchase large assortments of cards before (or sometimes after) the ads were applied. 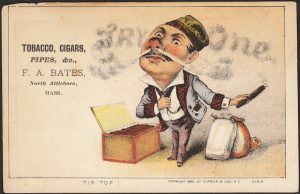 The printer Tobin, of New York, specialized in comical stock cards and satirical depictions of 19th century celebrities. This card appears to be a spoof on himself as the loudest card huckster of the city. 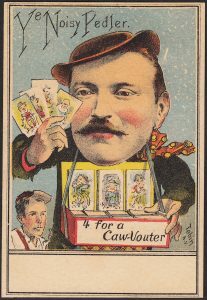 “Caw-Vouter” is New York accent for “Quarter.” The hawker is selling four cards for 25 cents. of the same basic card: sometimes with wildly different imprints, and other times no printing at all. or when a printer remakes the plates or subsequently changes details at a client’s request. 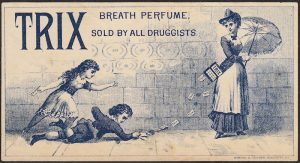 The prospect of free cards lured many consumers into stores and purchases they might otherwise have skipped. 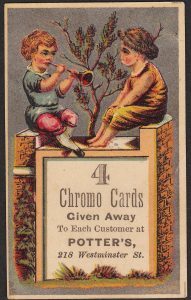 This Victorian trade card promises: “4 Chromo Cards Given Away to Each Customer….” It was left to the shopkeeper and the guest to haggle out the definition of “Customer,” and whether a purchase was required or not for them to receive their free Victorian trade cards. from affluent urban centers to rural farm villages and remote mountain mining camps. Today, many local historians and genaologists cherish these cards for the information they provide. 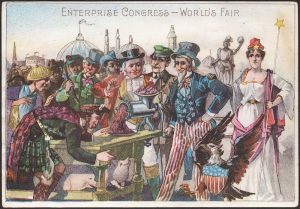 The prestige of trade cards plummeted after the Buffalo Pan-American Exposition World’s Fair of 1901.
was taking the nation by storm. 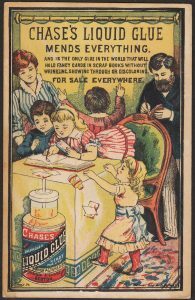 made gluing Victorian trade cards seem messy, and more like something “old-fashioned” only their mothers would do. and the new cards that became in many ways the equivalent of Twitter and Selfies today. 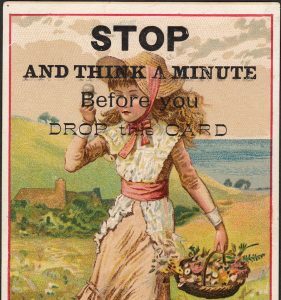 But more on the transition from trade cards to postcards at another time.